We are a LeapFrog family because waaaaay back when, the day the LeapFrog Tags walked into our lives as the first electronic ‘toy’ we invited into our family, we were hooked. 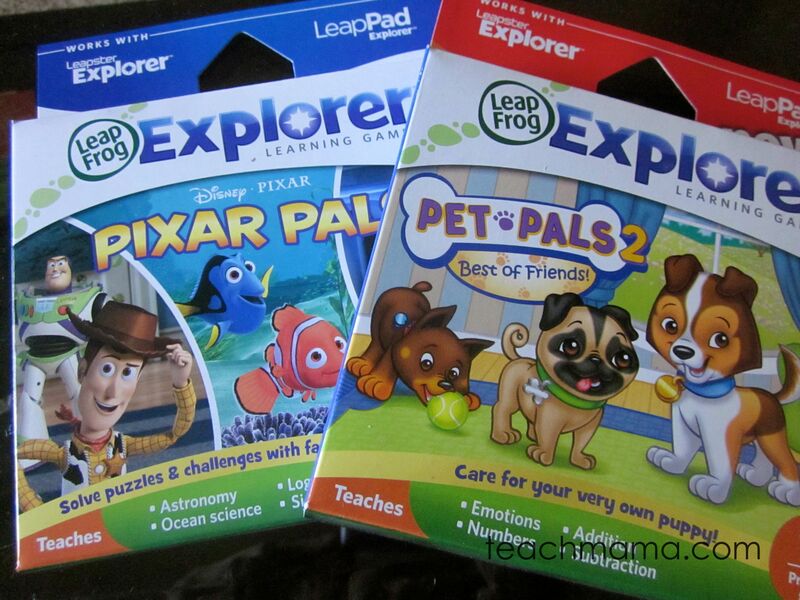 And each year, with each new release, the LeapFrog products just keep getting better and better. We have had the fantabulous new-for-us opportunity to try the LeapFrog LeapPad for the last few months, and it’s seriously awesome. Seriously. Awesome. And I am so totally over the moon that I have a LeapPad AND three cartridge games to give away to one lucky teach mama reader. Woot! This New For Us Friday, we’re sharing the LeapPad love. 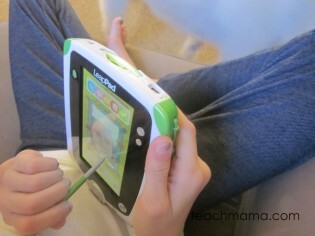 . .
LeapFrog LeapPad: Essentially, we absolutely love this device. We have tried many of the LeapFrog products–Tag, Tag Jr., Explorer, and Explorer Camera–so I was skeptical that the LeapPad coolness would surpass these, but it does. Maddy works on her story in Story Studio. . .
. . . which includes pictures, audio, video, and her own creative ideas! Don’t get me wrong–as much as Maddy, Owen, and Cora love the LeapPad, they still do reach for the Explorer and the Explorer Camera, and Cora often reaches for the Tag Reader. And at this point, I’m thankful we have them all. Sharing is getting a wee bit easier. But what I really love is that the LeapPad is like having a hundred devices in one–with the range of games, apps, and stories they can use with it–on top of the sleek design and tablet-like appearance. And the fact that kids can use the device with or without a stylus makes it seem even more awesome to them, I think–kind of like my coveted smartphone–but bigger. kids can create 27,216 story combinations using Story Studio! Leapster Explorer games are compatible with LeapPad–woo-hoo! LeapSchool — So fun. Focus is on reading and spelling and kids help LeapSchool friends create the coolest yearbook ever. PixarPals — Wall-E, Dory & Nemo, Woody & Buzz, and more are part of the fun as kids unlock science and logic puzzles, mini-games, and more, all with an astronomy, ocean science, logic, and reasoning focus. PetPals2 — Kids LOVE it and they loved PetPals 1. Focuses on teaching numbers, counting, addition, subtraction, and emotions, and kids get to create, name, and care for teeny, tiny pets. But there are many, many more incredible cartridge games for the device as well as apps and interactive books that can be purchased and downloaded from the LeapFrog site. There’s something for everyone. Maddy works on creating artwork–around her face. that like all LeapFrog products, it’s designed with kids and parents in mind–the games are fun, engaging, and educationally focused without being boring, and parents can track their children’s learning on the LeapFrog site in seconds. that it was catered a bit more toward left-handed children the stylus is connected on the right; HOWEVER it can be removed–AND kids can use their finger if they want. Knowing our kids, if the stylus is not tied on, it’ll be gone before we know it. that I had one of these for each of my kiddos–they’re that cool, and having three might avoid some arguments. UPDATE — Giveaway closed. Congratulations to Amy of Utah; she has been notified. Thank you, thank you, thank you for entering!! 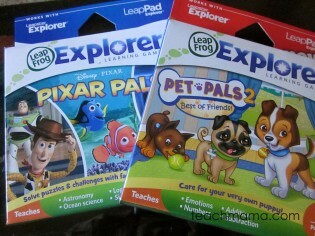 GIVEAWAY: One LeapFrog LeapPad & THREE cartridge games–LeapSchool, Pixar Pals, and PetPals2! All you have to do is leave a comment here (with email address!) explaining who will use the LeapPad if you win it. This contest ends on Friday, November 18, 2011 at midnight ET. Winner will be chosen by ‘And the Winner is. . .’ and will be notified on or around 11/18/11. Winner must respond within three (3) days of notification or forfeit the prize, in which case an alternate winner will be selected. All Official Sweepstakes Rules apply. fyi: We have had the opportunity to try the LeapFrog LeapPad for the last month, as I am part of the LeapFrog Review Program. All of the opinions here are my own, influenced only by the feedback of my three kids (7, 6, and 4 yrs) and my own experience as an educator and parent. This is an unsponsored post, but my family was given the LeapPad and several cartridge games and apps to review. LeapFrog will provide the LeapPad and cartridge games to the winner. My 4 year old would use this. He has the explorer, which we got him to help with fine motor skills, anything he learns about letters and numbers is gravy. I’m sure he would love the Leap pad. My 6 year old daughter would LOVE this! She is having a little trouble in school and we do I lot of drilling at home. Maybe this would make it more fun for her to learn!! We love Leap Pad products in my house, we just generally get hand me downs. But we love them all the same!!! Thanks! and shared with Josh Chace!!! My 4 1/2 yr old grandson would LOVE this. We love Leap Frog and I am sure this would be a great addition to the DVD. I pinned you in my grandkids category. I shared with a friend about your post. I shared it with my daughter. My 50 kindergarteners would be taking turns with the leap pad… and my son too from time to time when he visits my classroom. It will be well-loved! My 5 and 2.5-yr-old boys would fight over/love to play with the LeapPad. My oldest is big into writing stories, so the Story Studio sounds like it would be a hit. I just pinned the Days of the Week learning activity with the vitamin boxes. I love how you use simple, every day things, but make a conscious effort to turn them into meaningful teachable moments! I shared this post with a friend–my sister. Her kids would love one too. My two girls would fight over, uh, play on this quite often. It’s about time to upgrade from our Leapsters. Wow! What a great giveaway! I would LOVE to win this for my three kids – 4yrs, and 3yr old twins. They really enjoy all things LeapFrog, I’m sure this would be no different. I pinned it to my Ideas for Kids board! I Homeschool Preschool my 4 year old grandson and he is a non -traditional learner, We aren’t able to use work sheets and hands on materials. But I believe this leap pad would really help him. I Tweeted- Postal900. I shared on Facebook. My son is turing five and November. He would be over the moon if he had this game. He had the Leapster Explorer and I am thrilled that they use the same games. This would be so much more educational than the DS systems his friends are getting! I’m sure my young granddaughters would use this LeapPad a lot. With 3 kids under 5 we have yet to bring ‘electronics’ into the house. This certainly would be worth investigating since you have such rave reveiws of the Leap Pad! Mu six year old would use this in all of the hundreds of ways in can be used! He loves exploring technology and learning!! My 9 year old actually just asked me about this! I thought she might be a little old for it but I’d love to check it out! 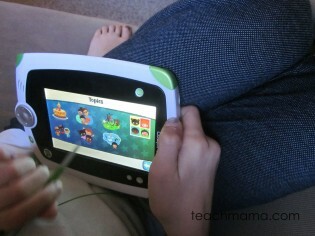 My 2 year old loves her hand-me-down Leapfrog Leapster so I know he’ll love love this, too! This would be fabulous for my granddaughter who travels long distances between her parents’ houses several times a year….Something that has lots of options to help cover that 10 hour drive! Okay, I just realized that it sounded like I said my 2 year old (who’s a boy) loves “her” leapster but I meant it to be that he loves his older sister’s leapster! haha. I would love to introduce DD to the Leappad! This would be for my son. 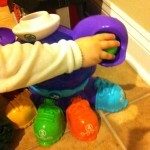 I have loved sharing the Leapfrog products with him and love how they have grown as he has. He loves his Explorer, but this sounds even more interactive and has the great camera! This is already on my Hanukkah list for Michael. I love it for the extra help with reading! I have a tech savvy 3 year old who loves playing on my phone & I just know she would get hours and hours of enjoyment from the LeapPad. I was wondering about the stylus and left handers and you’re the first review that’s mentioned this. Thanks for the informative review and the chance to win! This would be for my youngest for Christmas but I am certain the other kids would aslo enjoy it! This is fantastic. Thanks for the review. I just saw them in one of the newspaper ads and was wondering about them. My 3yo would love this. She wants to learn everything her big sisters are. She loves working on the computer and seeing what she can make it do on all the different learning games we have. She carries a book with her whenever we leave the house (just like mom). She also has her own backpack with all of her workbooks in for when we do school at home. I think this would be fantastic for her. If we don’t win one, I’m putting it on her Christmas wish list. My daughter has been asking me for one of these! She would love to win it! My soon-to-be four year old would be over the moon to win this. I’m not a very tech savvy person, so this would be a great educational and fun tool for the both of us. Thanks for the chance to win! Shared it with my sister. Fingers crossed! My three granddaughters would use this when they stay at my house. My emerging reader E will love this. She is four and has loved books since the age of 15 months. Thanks! My six year old Jessica and my four year old TJ would love the Leapfrog Leap Pad! My daughter and I have been looking at our local store for weeks! I know she’d love to have this. I would love to win a LeapPad for my 5yo twin girls! Put this one my facebook page. Oh man. Sign me up! My 5.5 year old son and my 4 year old daughter will fight over this little gadget! But they will love it too! My 4 year old son would love this! We have a TAG reader that is fantastic for road trips and some quiet time reading in his room. I pinned it! Don’t you love Pinterest?? my niece would love this and use it! We enjoy Leap Frog products in our house!!! I would love this for my children – 6 year old daughter and 3 year old son. I plan on purchasing two of them for Christmas – if I don’t win one! I have a little guy who will be turning 3 in a couple of weeks. This would be perfect as a holiday gift for him. The camera part is the one he’d use the most – he loves taking pictures! But, I know that my 13 y.o. son will also enjoy using it. He never had anything like this and just loves playing with electronic toys like this. In fact, I’m pretty sure that if I win, he’ll be the one showing little guy how to use it! My oldest son will be getting this! We were looking at buying him one for Christmas but I’d love to win one! I would love to give the Leap Pad to my 7 year old daughter for Christmas. I think creating stories will be her favorite part! Wow, I didn’t even know this product existed! I would love to give one to my daughter, who is going to be 4 in February. We’re just starting to work on letters and this looks like it would be a helpful – and COOL, aka FUN – way to work with her! Oh I would LOVE to win this! My 4-year-old son would have so much fun with this! My little guy, Miles, would love this! My oldest, Hudson, wants this so bad for Christmas. It would be fantastic if he won it instead – just saying. Oooh! We’d love to win. 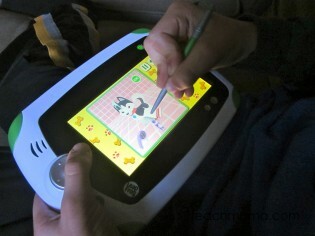 My 5 year old and 2 year old love their Leapster and I’ve been wanting to get one of these for them. I pinned your spooky halloween treats. I shared this with my friend Megan! 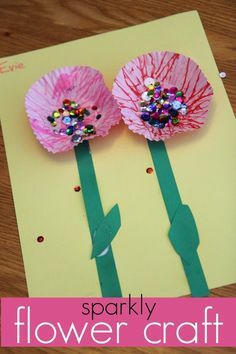 I pinned your fine motor simple sorting post. I emailed this to a couple of close friends who have younger children. This would be a great gift for my 3 sons. Ewan is 7, Rufus is 5 and Keir is 3 and I think they would all benefit from having this in our home. All 3 of my kids would love this (8, 6, 2)! Awesome giveway! I have two kids, aged 7 and 3 who would LOVE this. My 7 year old is playing with the iPad right now and I would like to have it back. 🙂 I think thinks looks great–we would be so happy to win this especially this holiday season. I pinned your outdoor play post under ‘cool ideas’. I just shared with my friend Sandra V about this great giveaway. Just pinned it as a great giveaway under my Seasons board. My 4 year old and 3 year olds would use it! It would be awesome! My six-year-old, Hannah would love to work on a LeapPad. She just started kindergarten. Her three-year-old brother, Luke, would enjoy learning how to use it too. My children are 4 and 6 year old. They would LOVE to have the Leap Pad for play, learning, etc. It is definitely at the top of our holiday list! i have a 6 yr old who loves Leapster, and the whole Leap family. I have a 5 yr old who does well and my 20 mth old will eventually use all the electronics his older sibilings have at this point. I would be extremely grateful to be given the opportunity to win this for my kids. I have two daughters 5 and 4 and they would love this. 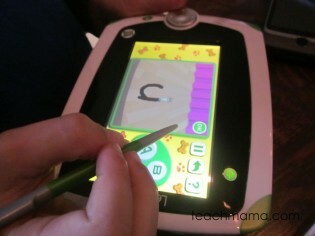 We have used the leappad book system from way back, and leapsters and tags and tag jr. I love how leap is moving with today’s technology. My 7 year old (and the 2 year old too) would LOVE this! Our little ones, Grace and Madeline, would love to see this under the Christmas tree. Thanks for the chance to win! i think all three of my kids would enjoy it! My son Kai will turn 5 soon and I know he would LOVE this for his birthday! I have a feeling my 2 year old, Isaiah, would like it too. I left a link to your giveaway on fb! Thanks! I pinned this post on pinterest! Thanks for the giveaway! Sounds awesome!! I know Lucas would LOVE this!!! jack has been begging us for a nintendo ds ever since bridget got one for christmas (she hardly ever uses it, i should say! she prefers her leapster!) so, i guess this would be a good stepping stone for him! This would absolutely be for my daughter if I won. Thanks so much for offering this incredible giveaway. I would give this to my daughter for Christmas! She would love it!! We are a leapfrog family as well. My 4 year old would love the Leappad. She has been hoping to get this for Christmas!! Thanks for offering this great giveaway! My 6 year old son, Aidan would absolutely love this. We love LeapFrog stuff too! My 6 year old son would love this. Would be an awesome Christmas surprise for him! I shared this page with my best friend who also has kids! I also pinned your “No More Trouble Doubling” entry. My son is learning math and this entry had some helpful hints! Our two girls would share, they are 5 and 4 and love their Tag readers! 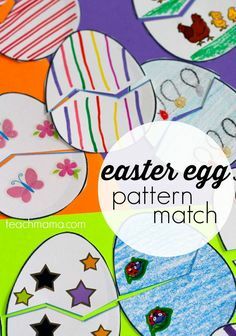 Pinned the patterning kabobs… Love this idea! I would give this to my six year old daughter for Christmas.! 4 year old son is very interested in technology! Great giveaway. Great blog. My three children will use it. My 8 yr old daughter + my twin girls. Maybe I will use a couple of times LOL! This is in our Christmas list and it would be awesome if we could win it! My daughters (6 and 4) would love this! If I win, we may have to buy a 2nd for Christmas! I have a 4 year old, 2 year old, and another on the way. They will all eventually use it…but for now it will mainly be for my 4 year old! My daughter would LOVE this-she’ll be 4 in the spring, but already works our desktop as well as I do! My five year old would love this! We have been looking for something to use in the car on long trips to visit family and as a way to reinforce her learning. Thanks for the opportunity to win this for my little preschooler! My daughter, age 4 1/2 would LOVE this. We love our Leapster 2. I’m sure here brother, 6 months will grow into it before we know it too! My 4 year old would love this – especially the video camera! I would love to win this and give it to my son for Christmas. He is turning 5 tomorrow and I think this would be perfect for him! These look so cool, I think we will all spend some time playing. Mostly for my 4 and 8 yr old though. Wow! We have been thinking about getting this for my youngest!! This would be awesome to win! My four year old would absolutely LOVE this!!! I would love to win this for my 4yo son. Both of my children (ages 3 & 6) would use this. And I would no longer have to worry about them messing up my phone (a Droid)! Totally a win, win!! My 5 yr old son would love this for sure. The Story Studio sounds especially cool! My kids would love this. IT is exactally what I am looking for! I shared with Jenni who also homeschools! Tweeted Away! My 4 and 2 year old would love this! My 7 year old son would love to use it! My 5 year old would love this! She is delayed with her speech and this would be a great. Her 3 year old sister would also like it. I would LOVE this for my 3 year old, Miles! My littlest who is dying for a DSI but I think he’s too young, will be over the moon if He’s THE ONE that gets this. They’ve all been talking about it! I would want to win this for my (almost) 5 year old! We love LeapFrog products, and would be so excited to put this under the tree for him! My 6 year old Lucy will use the pad ! She is an electronics junkie ! I won’t even have a chance to show her how it works. But isn’t that how all kids are ? My four year old would love this. She has 4 older brothers who all have cool electronic gadgets that are not appropriate for her. What a great invention for the younger kids! My 2 and 1/2 year old daughter, who is currently using her dad’s iPad while Dad is waiting for it, would LOVE it! I would love to win this for my 6 yr old son, whom is working on reading and math, to keep him moving forward. Santa would love to put one of these under the tree. Thank you for the opportunity. My 7 year old daughter talks about this all the time and how it is the only thing she wants for Christmas! She would love love love it! 🙂 Thanks for all the feedback Amy! WOW! What a great giveaway- My older son is already figuring out how to use my phone but would love something like this as there are no ads and it is entirely kid friendly. Would be fantastic for our 9 hour plane ride to Australia we do a couple of times a year as the busy bags I have made will only keep them busy an hour or two tops. I don`t live in the US but a friend lives on army base here and I have other friends in US so could use their shipping addresses if needed. Please feel free to delete my comment though if this does not qualify me. My 4 & 5 year old daughters would use it. 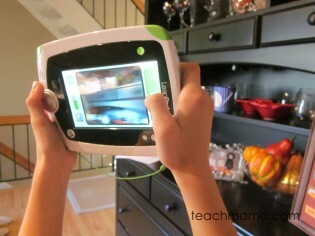 I would love to watch my nephew play with the leapfrog leappad! I’m a teacher and think they’re great. I would love this for my 3 year old! Thanks for the chance to win! I shared this with my cousin. Thanks! I will love to win it for my kiddos! We are big fans of LeapFrog products as well!! My four year old wants this for Christmas BADLY. 🙂 Would love to win it!! AAAANNNDDD shared you on facebook as well. i’d love to win this for my little boy who has autism. electronic toys are his favorite things to use! Please don’t post this publicly…Thanks! My oldest is 4 and would love to play with this! My four year old daughter would love this. I’m really impressed with all of the reviews and would love for her to have one for Christmas. Thank you for this giveaway opportunity! we love leapfrog products, too. My son Wesley, who is in love with the Tag system that we just brought into our house, will enjoy this one. Thanks for the review! I Pinned this under “gifts”…it’s on our gift list for our daughters. My niece would use the leapfrog! I’ve been eyeing these for a few weeks now! I pinned this post in my “preschool” folder. Shared this post with my friend Sara! I love this! I was just thinking today that I might need to get the girls one for Christmas. I have three children, but two would be using it immediately if we won. The Girls are 5 and 3 and little sponges I swear! My 3 and (almost) 5 year would LOVE this. I have been reading reviews on these and was hoping to get one for them for Christmas!!! PS. I tweeted it and shared on Facebook!! All four of my boys will get to play with this. It will make sharing the iPhones (mine and hubby’s) easier! My 4 year old son would love to receive one of these on Christmas morning! Tough decision. I think this one would have everyone wanting a try. This looks like a winner in our place. Either one of my kids would love this. We are definitely a LeapFrog family as well. My daughter would go nuts over this. It would probably be used by my 3 year old and 6 year old the most! But Mom wants to play too! Would love to win this for my daughter, age 4.5! I shared this post with my friend Sara, @vloky on Twitter! 😀 @VectoringMomma, tonikaye24@yahoo.com Thank you so much for the chance! I would give it to my 5 year old daughter because it is at the top of her wish list. Both my 5 yr old and nearly 4 yr old would love using this. They love using Nana’s iPad when the are allowed (not often) and beg for more DS time (less than educational). I’ve tossed around the idea of getting something like this, so winning one would be perfect. This would make a great, fun learning tool for my kids!! Both my 2 and 4 year old daughters (both will be a year older in December) would enjoy using this! My 5 year old son would love to have and use this!!! I shared this on my Facebook page. 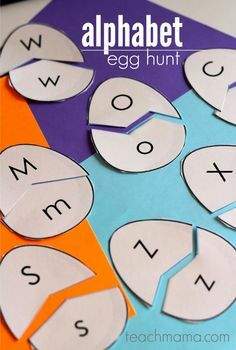 My 3 1/2 year old son would absolutely love this and I think it would really help him to learn his ABC’s and 123’s -not to mention he would love the camera too! My 3- and 2-year-old daughters will use it. Its #1 on my 3YO’s list! My little Layla would be the lucky little girl who would get this super cool LeapPad! She would LOVE it so much!!!!! What an amazing Christmas gift!! My 5 year old and 3.5 year old would be using this…their first “Big Kid” LeapPad product. I’ve been debating about introducing something like this into our house. I’d love to win! Thanks! My daughter would use it if I won. My daughter Ella would love this!! I would love to give her this for Christmas! She would gain so much knowledge from this. Not only would she have fun but I like that she will also be learning a lot! My 4 year old would love this. He hogs my new sony tablet all the time and would love one that was all his. My son is 4yrs old and he will really love to have the leappad… I believe is going to promote his speach. and he will finally be able to speak and help him read,learn colors, abc’s…reading…the leappad will be a dream come true! he loves to take pics! and the leappad will be just perfect for him please please please put me in the giveaway! my 7 year old daughter has had her on this for some time now. i would love to win it for her. my little girl … this would be great for her. My 3 and 5 year old will use this. 5 yr old is in kindergarten and I hope this will help her read (she is so close)! My boys would love this! They would both use the one to begin with, and then I am sure they would get another so they wouldn’t have to share it! I would be so excited to win this! My 4yr old daughter will use the Leap Pad daily & when she’s not looking I KNOW my 2yr old daughter will steal it! I posted the contest on Facebook. It would be for my 4 & 5 year olds – would have to get 2 but winning one would be great. They love mommy’s Nook & they love to learn! I shared this post with my sister, Shawn and several friends. I actually found your blog through pinterest, and I have pinned several of your ideas. I love the shoe tieing box and uses for recyclables. This would be so great for my (almost) 4 year old and 5 year old. They love our other LeapFrog products too. The LeapFrogPad is our children’s learning tool for their generation. What a Great start on new technology preparing them for their future. My three year old grandchild would have a learning advantage if I won this pad. Look out Jetson’s here we come! Would LOVE to win this for my four year old daughter. My older daughter relied on LeapFrog products heavily during her early years, as she struggled with a language disorder (phonological processing disorder) – we found so many of their products/games emphasized phonics (the Leap Tag in particular) that it truly helped her with her at-home therapy. Now my younger daughter is showing signs of a similar delay and I would LOVE for her to have a Leap Pad and the same Leap Frog advantage my older daughter had. Great products! I would give this to my daughter for her birthday at the end of November or for Christmas. I’ve recently been very interested in this product for my two boys, age 4 & 3. I’m sure my daughters, age 9 & 6 would also enjoy some of the features on the LeapPad! I’ve shared this post and your blog with a friend. I’ve repinned it to my ‘kids’ album. Good luck to all other contestants! My son Caleb (5 years old) would love this. Caleb is a smart boy who has me as his preschool teachers as well as Mommy. Sometimes I think technology can really help kids learn and practice new concepts. Winning this LeapFrog LeapPad would allow Caleb to practice his learning independently, or without listening to me 🙂 His little brother Connor (2 years old) would enjoy taking turns also. As a previous 1st grade teacher I know how effective LeapFrog is and am so interested as to how you are part of the review team. I shared this contest and your site with all 9 of my preschool parents and on Facebook. 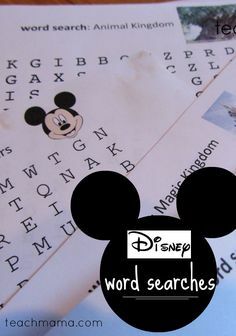 My four year old little girl would love to use this and I think it would be a great learning tool! I will give this to my son if I win! My 5yo would love this, he’s outgrown his little FP laptop and I was looking at this just yesterday. My girls 6 and 4 would love the LeapPad. My nephew is also here half a day and it would really help me work on his lowercase letters with him. We have an explorer that all three kiddos fight over. My two oldest daughters have a DSi and the little girls beg for one but I would so much prefer a LeapFrog Learning product. 🙂 Thanks for always having awesome giveaways. I shared on my FB wall and told my freind Nancy about it. I want to get these for my twin 3 year old boys for Christmas – I know they will love it and learn a lot! Thank you! WOW this would be awesome. We have six children so holiday time gets a little difficult. I have 3 yr old twins and they would absolutely love this. Our neighbors child has one and whenever we go to visit they love playing with it. Our twins were premie so they have some learning delays, but after watching one of the leap videos that has to do with letters they we repeating everything it said which was great to hear. This would be a great learning tools for them as they have been in speech and physical (for fine motor skills) therapy since birth. Using the stylus would help with the fine motor skills. Our 6 yr old has the explorer and they love to watch her play. This would be greatly appreciated by my family. Thanks for this wonderful opportunity and I wish everyone the best of luck. I also shared with Tammy Kibodeaux on facebook. Benjamin would love to play on the Leappad! We have the older model and the screen is so dim you can’t even see what you are playing. Thanks for the awesome giveaway! I pinned a pic of the Leappad to my Products I Love Board! I shared the link on Facebook. Hooray! I am tech savvy…. Wow! My boys would love this! They are all over the electronic learning devices! I would LOVE to win this for my 4 year old!!!!! So fun! We have already planned on purchasing my 3 year old the leapPad for Christmas. Winning this package would sweeten the deal and free up money to buy the case, a/c adapter and more games!! Good luck to everyone! We have already planned on purchasing my 3 year old the leapPad for Christmas. She is constantly stealing our smart phones to write letters and draw. Winning this package would sweeten the deal and free up money to buy the case, a/c adapter and more games!! Good luck to everyone! We would use this for my 5 year old and 3 year old boys. We plan on homeschooling . This would be a fun way to help them learn. I shared with my mother. My girls (1 1/2 and 4) would love this! My 6 year old would love this she has the leapster 2 and a ds and she plays her leapster more! She loves to draw and create storys she is always asking for my phone so she can take pictures and videos she is very creative. She also loves to read and write! My husband and I are bouncing between this and some kind of android tablet but i think this is more age approprate and! Oooh, I would love to win this for Ladybug for Christmas! Sharing on Totally Tots right now! We would love to win this awesome giveaway! My four year old son is so eager to learn- this would be a great addition to assist him! I would use this along with my son, who is only 1. We love to read and he loves watching me read on my nookcolor. If I won, I could read to him from this so he feels like he’s reading from a nook too. We also have loved Leapfrog products since my 8-year-old was a toddler. Now, my 3-year-old daughter loves them, too. She loves playing her Leapster and would be thrilled to have a Leappad for even more playing and learning. Plus, the portability is great for all the times she has to sit during her older brother’s sports practices and his weekly allergy shot. My 4 yo grandson has Asperger’s and his TAG JR really helped him. I think the Leap Pad would be great to give him a head start. My 5 year old would love this. She got the Leapster for her birthday last year, but the touch screen stopped working. My 3 year old daughter. She loves leap frog and computer games! My 3-year-old daughter wants a cool gadget like her daddy’s laptop – I know she’d be crazy for something like this! We had an old style leapster but it died on us (it was used before we got it). She was on it every day so I know she’d love this! My 4 yr old & 6 yr old daughters would LOVE this!! A day does not go by that they do not play with (or watch) something that Leapfrog has made. I love Leapfrog for making learning fun & easy!! My daughter would love this! What a great Christmas Present! I have been eyeing this for our daughter! Super fun giveaway!! Shared this with my friend Bobbie. wow!!!! my 6 year old daughter would go crazy over this!!! she treasures her leapster explorer!!!!! We would be so excited to win this! 🙂 My 5 year old daughter and 7 year old son keep asking for one. I think it’s a great product! I would give it to my 4 year old daughter. Maybe then I could get my Itouch back for myself! My nearly three year-old would become the proud owner of this if we were to win. Thanks for the giveaway! My newly turned 5 year old and I were just checking these out. They look fabulous! We love our Tag readers, but might be ready for an upgrade – we would LOVE to win!! My almost 5 year old twins would share this. We don’t currently have any electronics for them, but I think it would help with some of the challenges that one of them is having. It looks like a great holiday project that my kids would love! my 4 year old would LOVE this. I could hardly pull her away from it in wal-mart! I pinned your title banner on my giveaways board with the caption of the givaway and end date. Both of my daughters would love this! Thank you so much for this post. My 4 year old son Aaron would LOVE this! This would be a wonderful gift for my 4 year old! She is eagerly learning how to read so she can catch up with her older brother. We LOVE Leapfrog in our house too. I am sharing this on FB with my friends. Thanks! My five-year old daughter, Alena, would love to have a Leapfrog Leappad. She is a busy girl who is always coloring, drawing, and asking me to help her spell words while still in preschool. Down the road, we would love to be able to pass it down to our younger daughter, Bekka, too. My 3 year old son would really enjoy this or my newphews. If I won this it would be for my daughter, Emily. She would love this, not quite old enough for a DS, so this would be perfect! This would make an excellent learning tool for my grandson. I would love to win this for him. My grandson would love to have this, my daughter is thinking of home schooling. My 7 year old daughter and 3 year old son would probably be doing extra-special chores to get some game time. I hope they get the opportunity! My 6 year old was looking at this tonight as we went to look for some Christmas gift ideas. He would LOVE this! It would be a Christmas gift. I shared the link to this post on FB. Leapfrpg makes the best stuff. All 3 granddaughters will enjoy this! Always a challenge to figure out how to adapt for the one that is blind. But we can do it! My four year old daughter would use it. She’s been asking for this so would love to win this for her. My son, Jacob(4) has the explorer, but his has a hard time sharing it with his sister, Isabel(3). So, I’m hoping that if we could get the LeapPad they would be more willing to share with each other. Wow! I would love to get this for my little girl. We are homeschooling and she is struggling a little bit with reading. She loves all things electronic so we were thinking of getting one of these for her for Christmas, but our budget is very tight so I don’t know that we could make it happen. What a blessing if we won one! My almost 3-year-old daughter will use this. We’re expecting a new baby, and it will be premature due to some complications. So we could be spending some time in the NICU and then indoors for quite a while. It will be good for my daughter to have something fun to play with when we can’t get out and about quite as often. My kids ages 2, 5, and 8 are likely to all want a turn! I like that it can hold different settings for each and that it’s so durable. It’ll really motivate our budding storytellers/photographers/readers. We’ve been waiting for something like this for kids! My 8 year old has already requested the Leappad for Christmas, it is the only thing she wants. I would love it for her because she is the youngest of 4 children and my time is stretched thin during homework hours, especially with my 10 year old having Aspergers. I think the Leappad would be an excellent tool to have to keep my daughter interested in learning. My three year old who is on the autism spectrum would enjoy this. Thanks for the chance. I have a 2 year old son and 3 month old daughter who would both end up benefitting from this! My 4 year old son would be using it. We have Leapfrog Leappads of old & we have the leapfrog leapsters…..but we need to move up. We love their learning to write toy & their text n learn letters toy. i also shared this with 3 friends by email: Jenny Foringer, Becky Dennys & Heather Nittenger. Thanks for the opportunity to win. I love Leapfrog products! I will love to win this! My 4 year old is very into the older version of Leap pad and he has learned so much independently by just playing with the games. So I will really love to try out this. I would love to win this for my first grade classroom. I recently purchased some TAG readers for my class…especially those kids that never get read to….and I love them! LeapFrog is so innovative and technology is a way to get even the most struggling interested in learning. I would love to win the LeapPad for my 3.5 year old daughter, Clare. She has used a friend’s Leapster Explorer and really enjoys it. I also have a 20 month old son, Ian, and another due any day now. One of the great things about LeapFrog products is that they are practically timeless, so my younger children will get great use out of it as well. I’ve shared with my friend, Angie. I’ve pinned the link on Pinterest. My 6 year old would love it! My 4 year old son would LOVE this. He plays on his grandparents iPad, and would be thrilled to have one of his own. Any help with reading and writing that AND fun for him is much needed at our house!!!! 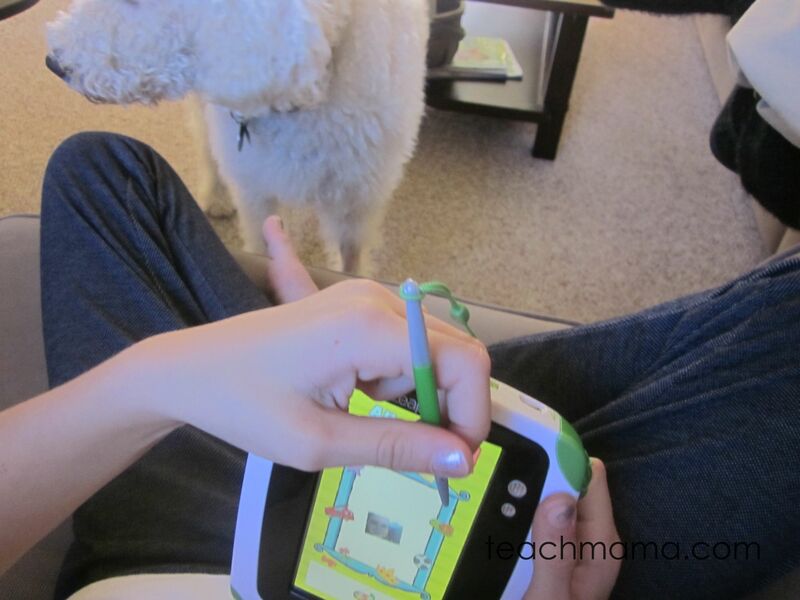 And it looks like his Mommy can’t write a complete sentence either….. he really NEEDS help, the Leappad is the answer!!!! I would love to win this for my niece, it’s all that she is asking for Christmas !! I’m sure the kids I babysit would love it too! I liked this post on my Facebook!! I pinned this post on my pinterest, good luck everyone! My 3yo daughter Brylie! This will be her FIRST LeapFrog ‘toy’! My sweet 4 1/2 year old would LOVE a leappad. My 5 Yr old daughter and 4 yr old son would LOVE this! Wow! Pretty amazing item there, have to go ahead and put our family in since both of my kids would adore this! If we were lucky enough to win, my boy/girl twins (who will be 3 in December) would share it. We wanted to buy one for them but we found out my husband’s place of employment is closing its doors, so we are trying to keep expenses in check at this time. I submitted this on my FB wall and in 5 private groups. would love to win one for my son age 5! tweeted! So many entries, but I really hope to win. oh, my son evan would loooooooooove this! he is 4.5… although i’m sure my almost 2 year old would find a way to enjoy it, too! Love it! We also love the Leap Frog Tags. I have two boys who share just about anything (4 & 8); I imagine they will LOVE this too! Thank you! My 4 year old son would love this! All the reviews have been excellent! This would be a joint present for my 5 and 7 year old… and my husband and I, too, since we don’t have a smart phone/tablet device. Thanks for this fabulous giveaway. My daughter would adore this. We do not have any Leapfrog items, but she adores using them at her friend’s house. This would be an amazing addition to our playroom. This would be a Christmas gift for Aidan. HE LOVES taking pictures. This tablet with all its functionality is so great and would be awesome for him to learn AND play! Would love to have one for my 2 year old little man. I am sure my other two older kids would love to use it too! My daughter Chezney who is in 1st grade would use it. She has struggled through school, especially with reading. We had to repeat Kindergarten which has given her a few self esteem issues, but we take things one day at a time and hoping that reading will come easier with time. I think this product would be awesome for her to have and use. Thank you! Shared with my wonderful friend, Melinda Cowell on FB. I have a 3 & 4 year old that would love to win one of these . We never own a leapfrog anything . I wish I can afford one of these but being a single mother is hard with three kids . So I thank for an opportunity to enter this giveaway . I pinned your 2010 Holiday Gift Guide. Thanks for great ideas! our 3-YO twins like to try to use our iPhones and laptops and they absolutely love the LeapFrog DVD’s we just started buying, I am sure they would fall all over one of these. Oh, they have the My First LeapTops too. There is no faster way to get them to pick up their toys and sit quietly on the couch that to say “it’s LeapFrog time”! My kids would love to win this!! We have no leapster toys as of yet but welcome one! Thank you for such a generous giveaway and a great opportunity! This product sounds exactly what I have been wanting for my kids. I have a five year old who would absolutely love something like this. I would LOVE to get this for my kiddos. We love Leapfrog products! I would love to be able to give my 3 year old and 10 year old a new leap pad to share.. I know 10 sounds older for this Christmas item but she saw it in the store and loved it!! What can I say my kids love leap frog!! My 6, 7, 8, and 9 year olds would use this. I shared about this post on facebook. My facebook name is Kd Blackburn. I shared this post with a friend, Nick Blackburn.